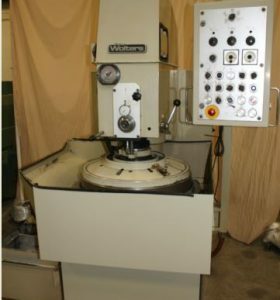 Lapping machines are a type of precision finishing machine. 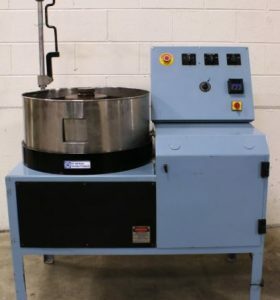 Lapping is a loose abrasive machining process that differs from honing or grinding because the abrasive action comes not from a solid abrasive (like a grinding wheel) but from a slurry--abrasive particles mixed with oil or water. The slurry forms an abrasive film between the underlying lapping plate and the parts to be lapped. The part stock is gradually removed through the rolling and sliding action of the abrasive grains between the lapping wheel and the workpiece. The slurry, along with the removed stock, drains away from the table. 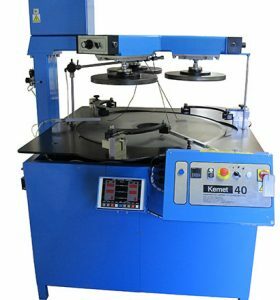 Lapping machines create truly flat surfaces--normally up to 0.001mm, with surface finishes of better than Ra.01. Overall, lapping produces extreme dimensional accuracy, corrects minor imperfections of shape, refines surface finish, and produces close fit between mating surfaces. Lapping machines may be beneficial whenever absolute flatness, parallelism, or surface finish is essential. Since it is a loose abrasive process, irregularly-shaped or non-magnetic parts can be easily accommodated. Lapping removes stock quickly, with no clamping or heat distortion, no expensive tooling required, and virtually no maintenance. Inspection and production costs are also lower, since the machine can be run by semi-skilled operators. Parts can be run as easily in small batches as in production processes. The process eliminates warping, since parts are not clamped and very little heat is generated. Lapping produces no burrs and actually removes light burrs. Any part the machine can accommodate can be lapped, regardless of thickness or shape. However, lapping requires a level of experience and skill, and trial and error may still be needed to get the optimum results. For answers to your questions or more information on lapping machines call Liberty at 847-276-2761 or send us an email sales@libertymachinery.com. 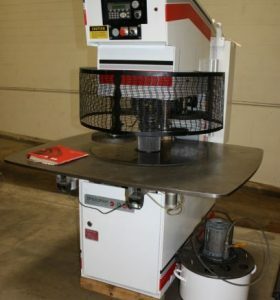 Liberty Machinery buys and sells all types of lapping machines. 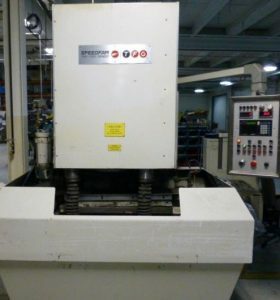 We are your trusted source for high quality lapping machines and other used equipment. 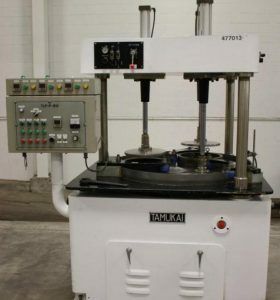 Lapping machines consist of 5 parts: the rotating table (called a lapping plate), several conditioning rings, the topweight, the slurry, and the machine itself. 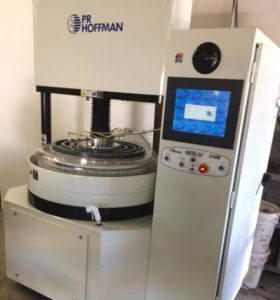 The machine houses the controls, engine, coolant, filter, and other subsidiary components for proper operation of the mechanism. The lapping plate is the only thing that is turned by the motor--the conditioning rings turn automatically as the plate itself turns. The plate is usually made of high-quality soft cast iron, though copper and other soft metals may also be used. It may be anywhere from 12 to 144 inches in diameter and feature spirals, cross-hatches, rings, or other shapes. The conditioning rings function as the workholding device. These rings distribute the wear evenly across the lapping plate increasing its life, while also holding the workpiece in place. Special rings may be fitted for cylindrical or especially long pieces. A top plate presses the pieces down in order to ensure abrasion occurs. These may be simple lids or mechanically operated piston-like covers. A slurry made by combining various abrasive materials such as diamond or carbon with a liquid base like oil or water is fed between the lapping plate and the top plate, and distributed evenly across the surface by the plate's rotation. 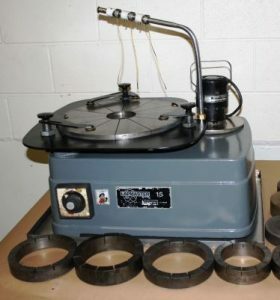 The tiny abrasives suspended in the liquid drag and tumble across the surface of the held pieces, grinding away at any micro-irregularities in the part's surface. When using lapping techniques it is possible to remove as little as 0.000002" of stock. Typical stock removal after grinding is 0.002-0.0005". 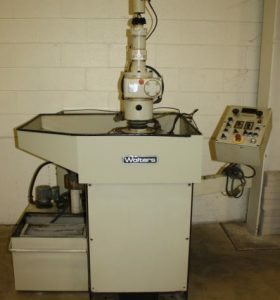 Liberty is always looking for used lapping machines to buy for inventory. Contact us and let us know what you have for sale. We’ll be happy to give you a free quote. 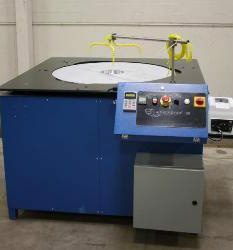 See our used lapping machines for sale. 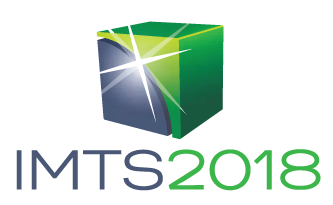 George Schneider, Jr., Cutting Tool Applications (Farmington Hills, MI: ASM International, 2002), 213. Lapmaster International, "Bulletin LAPCONLAPUSA 98," (Morton Grove, IL: Lapmaster International, 1998). Dirk Schibisch, "Fine grinding with superabrasives," Ceramic Industry, Dec. 1997. 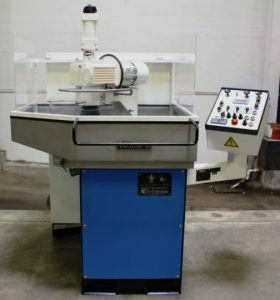 Technalap, Inc., "The Latest Technology in...Flat Lapping, Free-Abrasive Machining, Optical & Diamong Polishing," (Lake Wylie, SC: Technalap, Inc, n.d.). Lapmaster International, "Bulletin LAPMFWLUSA 98," (Morton Grove, IL: Lapmaster International, 1998).